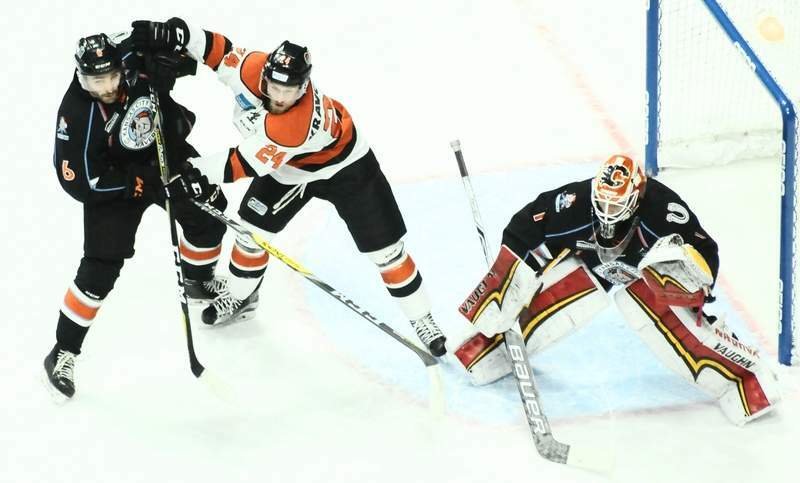 Justin A. Cohn | The Journal Gazette Komets forward Dennis Kravchenko, middle, battles for position in front of the Kansas City Mavericks net with Nate Widman, left, while goaltender Tyler Parsons readies to make a save Friday night. 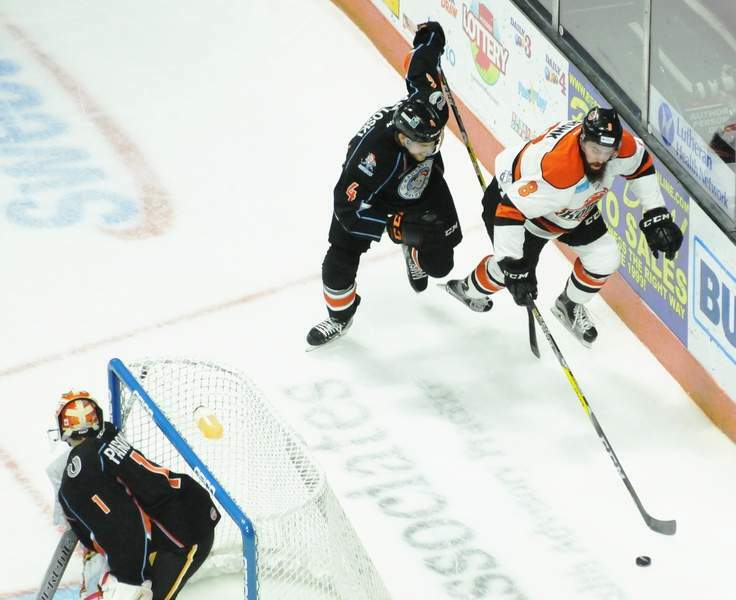 Justin A. Cohn | The Journal Gazette Komets Dennis Kravchenko, left, and Bobby Shea swing at the puck in front of Mavericks goalie Tyler Parsons. 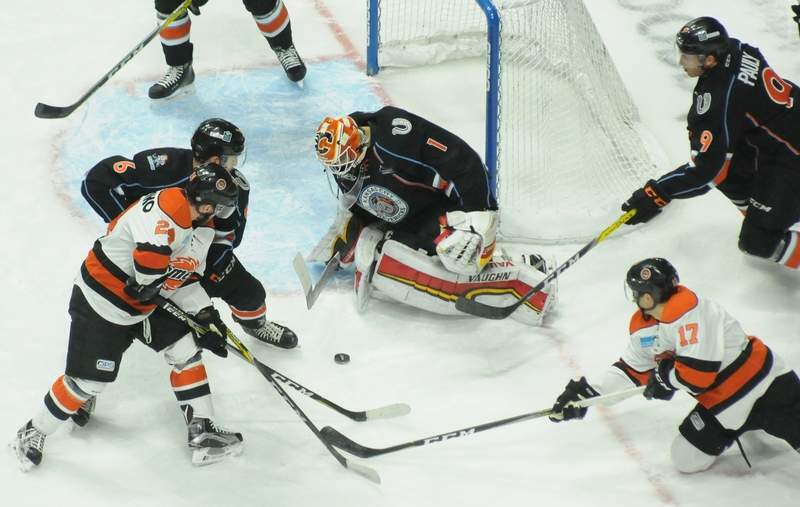 Justin A. Cohn | The Journal Gazette Komets forward Taylor Crunk, right, stick-handles with the puck behind the Kansas City Mavericks net at Memorial Coliseum as he's defended by Bruce Aneloski and goaltender Tyler Parsons looks on Friday night. 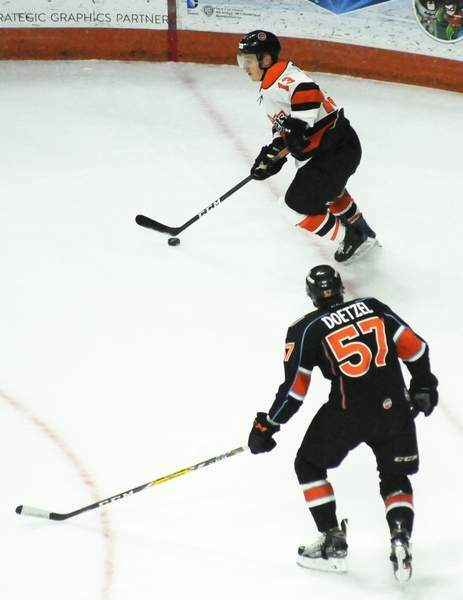 Justin A. Cohn | The Journal Gazette Komets forward Artur Tyanulin, top, prepares to pass the puck Friday night at Memorial Coliseum as the Kansas City Mavericks' Kayle Doetzel defends in front of his own net. Justin A. Cohn | The Journal Gazette Komets captain Jamie Schaafsma, top, passes the puck out of the defensive zone at Memorial Coliseum on Friday night as Kansas City Mavericks forward Jordan Kwas tries to bat the puck out of mid-air. 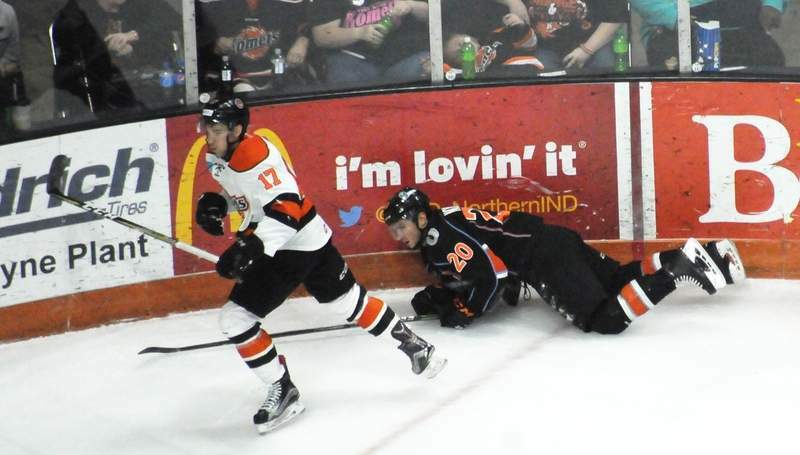 Justin A. Cohn | The Journal Gazette Komets defenseman Bobby Shea, left, skates for the puck after dropping the Kansas City Mavericks' Darren Nowick to the ice with a body check at Memorial Coliseum on Friday night. OK, lots to cover tonight. Let’s start with what Komets coach Gary Graham said about the rationale for trading Ralph Cuddemi to Wichita for Louick Marcotte today. Marcotte should arrive Saturday and, I presume, could play Sunday against Tulsa. That is, if there’s a game Sunday. There’s a chance that’s in doubt after Oilers coach Rob Murray, a former Fort Wayne player, collapsed on the bench in a game at Quad City tonight. Latest report from the Oilers is that he’s in the hospital and was communicative. I would imagine that, as long as Murray is OK, that the game would be on and someone else would coach the Oilers, but I’ll update you on this Saturday. There was a lot of good. 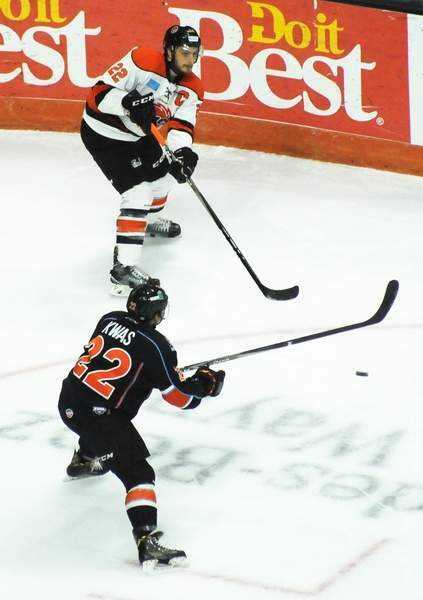 The Komets are driving to the net better than they were a couple weeks ago. They are coming up with opportunistic goals. They are fighting – hello, Daniel Maggio – to fire everyone up. And they are showing some resiliency; they battled back from two goals down tonight. But there is plenty of bad. I suppose it’s worth mentioning the Komets have played almost the entire season without arguably their best player, Justin Hodgman, but few could have expected they’d be 5-5-2 and I feel like people are getting a little antsy right now. Usually Dec. 10 or so is the date around here. If they are still .500 then, I would expect a lot of big changes. But I still think the Komets will be fine. There’s too much talent for it not to be. And they seem close to putting it together to me.